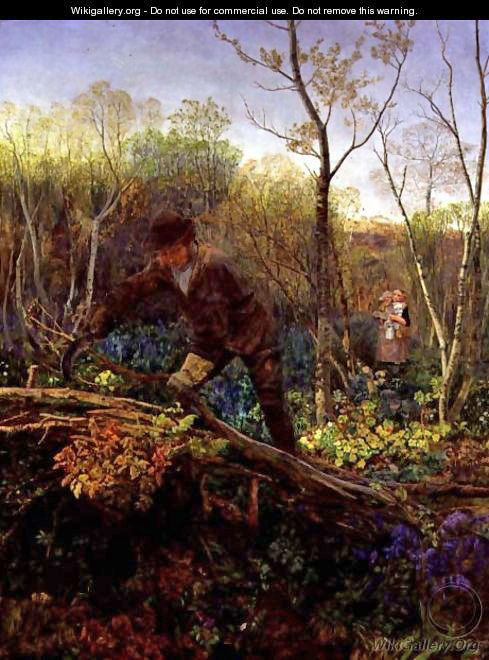 Have a look at John Brett’s painting, oil on canvas, The Hedger (1860). It shows in remarkable detail a ‘plashed’ hedge, the gloved left hand of the hedger holding down the transverse branches and the right hand clasping a billhook. The glove looks remarkably like a long cuffed one belonging to Green Gym. Never mind the fact that he is hedging when the flowers of the field and woodland appear to be in full bloom, never mind the curvy bill hook, he gives us a lovely picture. It would look good on the wall of the Boardroom back at GG HQ. In the Chairman’s office perhaps? Professor Oliver Rackham who died on 12 February 2015 writes of this picture as being only one ‘with a convincing wood with stools of oak and ash’ pointing out that the Pre-Raphaelites did paint in the field, usually in the Summer, but found difficulty with leafy trees. Rackham was a doyen among Britain’s eminent environmental historians writing and researching extensively about woodlands, the countryside, the historical landscape, botanical studies and plant archaeology. Brought up in rural Suffolk he won a major scholarship to Corpus Christi College Cambridge where he spent most of his professional life. He achieved many honours and received awards a plenty in a busy industrious career not least as an outspoken critic of the globalisation of the tree planting movement. Oliver Rackham is best known for his magisterial 400 page book The History of the British Countryside (1986) in which he traces the development of the historical landscape with chapters on woodland, hedgerows, marshes and the sea. The Illustrated version followed in 1994. His extensive research into Hayley Wood Cambridgeshire developed the concept and complexity of ‘ancient’ woodland and the continuity of management over centuries through traditional practices such as coppicing. His Woodlands (2006) extended his analysis well beyond these islands and into tree typology, forestry and art history. What has Rackham to say to us volunteering within countryside conservation? To me this revolves around two things, continuity and context. Let me explain. Continuity means that managing a boundary-woodland, lane, field- meaning pruning, cutting, tie-back is needed now as it was a hundred years ago, two hundred, five hundred, the tools may be different, the force and power of the natural world are immutable. Our landscape carefully managed is a visual expression of that continuity. Context is the other dimension. This means an activity whether woodland management of coppicing or planting, felling or habitat building is within a context of balances and sustainable equilibrium. One intervention is harmful for bluebell growth or other woodland flora but allows light and air to another sub species. Another favours public access on foot which is part of a political and social context but may disturb a threatened mammal’s survival. No field conservation activity is in its tight cocoon it is always part of a wider context, the wider environment.